Cassava, common name for any of several related plants native to tropical regions in the Americas. Cassava is the West Indian name; manioc, or mandioc, is the Brazilian name; and juca, or yucca, is used in other parts of South America. The plant grows in a bushy form, up to 2.4 m (8 ft) tall, with greenish-yellow flowers. The roots are up to 8 cm (3 in) thick and 91 cm (36 in) long. 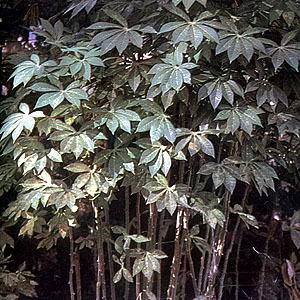 Two varieties of the cassava are of economic value: the bitter, or poisonous; and the sweet, or non-poisonous. Because the volatile poison can be destroyed by heat in the process of preparation, both varieties yield a wholesome food. Cassava is the chief source of tapioca, and in South America a sauce and an intoxicating beverage are prepared from the juice. The root in powder form is used to prepare farinha, a meal used to make thin cakes sometimes called cassava bread. The starch of cassava yields a product called Brazilian arrowroot. In Florida, where sweet cassava is grown, the roots are eaten as food, fed to stock, or used in the manufacture of starch and glucose. Scientific classification: Cassavas belong to the family Euphorbiaceae. Both bitter and sweet cassava are classified as Manihot esculenta.